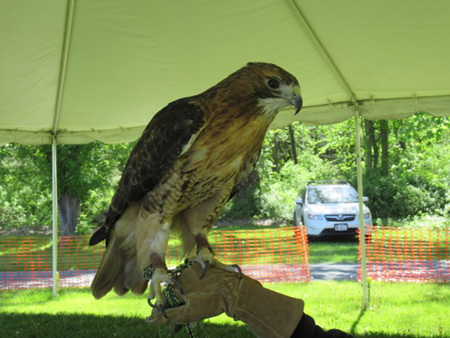 Way back in the last century when the old folks were young and useful, hawks and eagles were almost extinct in the State of New York and were rarely seen anywhere in the United States outside of Alaska. The few people who noticed this disappearance and who were concerned, mostly naturalists and wildlife biologists, became aware that the dwindling nesting pairs of many raptor birds were simply not reproducing and replenishing their numbers. The ecological damage caused by this approaching extinction at the top of the food chain was not well understood at the time, but it was becoming clear that birds such as the national symbol, the bald eagle, were unlikely to survive for much longer. It was in the 1970s that a group of these naturalists and other concerned citizens took it upon themselves to figure out what was killing these raptors. As is well known today, the culprit was found to be the pesticide DDT which concentrated in the bird’s bodies and made them sterile, once the poison was banned the birds became numerous again and we see them today even in populated urban areas. But few people today know how the activism of these naturalists convinced the New York Department of Environmental Conservation (DEC) to take up this cause and lead the nation in promoting the recovery of these birds. 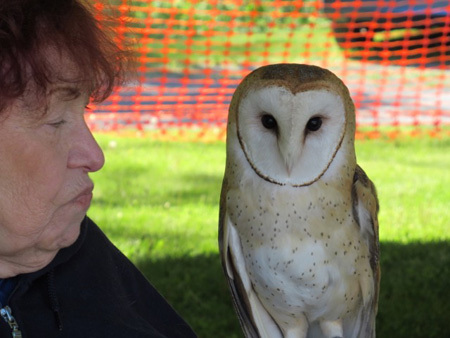 The Wife and I recently went down to Schodack Island State Park for the Raptor Festival put on by the Audubon society of the Capital Region. As far as I can tell this is an annual event that is held in a different place in this region every May. 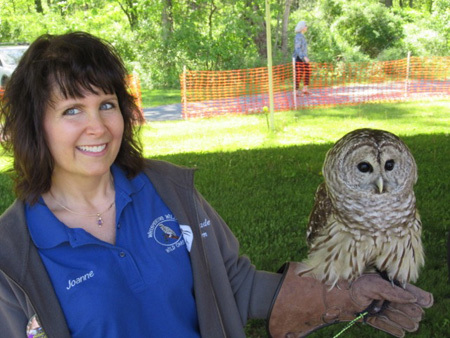 Back in 2011 we stumbled upon this event at the Nature Center at Thompson’s Lake up in the hills in western Albany County when we took our boats up there for the day, so we hoped we could attend the event in the future when we had more time to appreciate it. 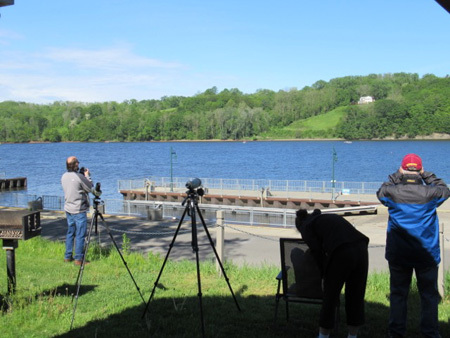 We were also curious to see Schodack Island Park, which opened in 2003 and established some 50 overnight campsites just last year. The park is a very long narrow island in the Hudson River just south of the City of Albany, running south from Selkirk and ending in a point well past New Baltimore in Greene County. Only a small part of the island is accessible to us tourists, much is mostly undisturbed habitat, while the southern tip of the island is used by the Army Corp of Engineers for dredging the nearby channels, a constant operation every summer. 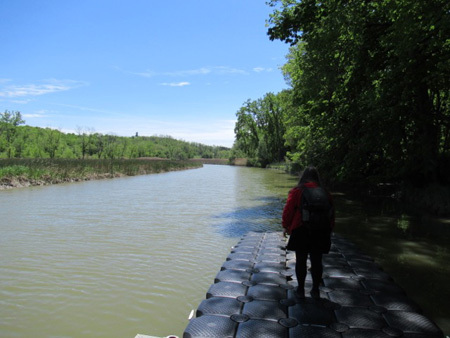 The island is separated from the east bank of the Hudson by Schodack Creek, which up on the northern part where the park facilities are is a marshy creek that is only navigable by non-motorized boats during high tide. Actually the island is technically not an island because the northern tip is connected to the mainland just south of Castleton, this is where the only access road is to the visitor’s area pavilions and campsites. There used to be a series of islands like this in the northern part of the Hudson that are now attached to the mainland, it’s a wonder that the creek was never filled in and the island developed either for commercial or residential use. According to a signboard Schodack Island was settled by Dutch farmers in the 1600s. Before that the island was a meeting place for the Mohican people who lived on both sides of the river, the name Schodack is derived from the Mohican words “ischoda” or fire plain, and “akee” which means land. There was a Mohican settlement on the southern tip of the island but remains of the site have been obliterated by the dredging operation. 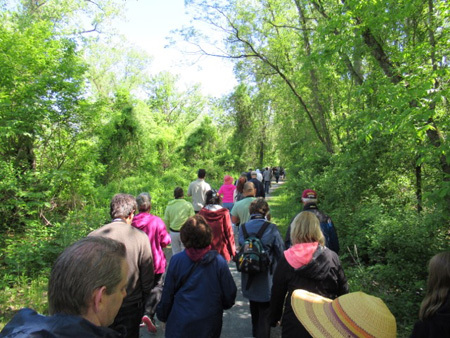 We arrived at the festival at 9:30 AM and joined about 70 people who took a walk with a gentleman who is an expert on bald eagles, and sure enough we spotted a few in the distance. There are three nesting pairs of bald eagles around the island, they mate for life. The birds build nests high in trees that they return to annually, the nests are quite heavy and sometimes as wide as six feet across. The bald eagles we saw were circling and diving for fish in the Hudson. They are skimmers, they don’t dive through the water like falcons do. With their incredible eyesight they circle high in the air, and when a fish moves near the surface they swoop down, grab it in their talons and bring the prey to the treetops to eat. On the north end of the island are the big concrete pillars of the I-90 Thruway bridge that heads east across the river to Massachusetts, these pillars are a favorite nesting place for the peregrine falcons. These birds dive through the air from incredible heights, sometimes reaching 200 MPH, and take out their prey by slamming into them. If that doesn’t kill them the falcons then use their powerful beaks to snap their necks. Sadly, we didn’t see any of them on the walk. 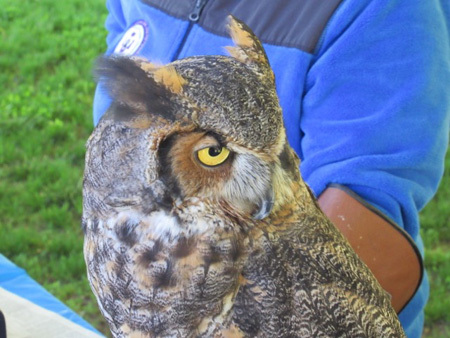 The main attraction of the Raptor Festival was, of course, the raptor birds on display. These were all rescue animals that had injuries that would not have allowed them to survive in the wild, so they spend their lives in captivity. Their handlers at the festival were all private commercial concerns, one of them even announced that they were available for birthday parties. One might argue that keeping the birds alive in captivity and in effect putting on display performances for people is a cruel thing to do, but I’m not sure about that. Giving these magnificent animals a further lease on life for the purpose of educating humans and satisfying their curiosity is useful for the survival of their species, teaching the humans to respect them and to support efforts to ensure that they continue to prosper. And this helps humans to establish connections with both the birds and with the ecosystems that they inhabit. Nature is not forgiving for the lame and halt. Some folks do indeed argue that nature should take its course and kill the birds, but in a world dominated by humans who shape the landscape for their own needs there really isn’t much natural course left to speak of. What nature we still have must be managed if it too is to survive and provide habitat for animals like these, and for us. 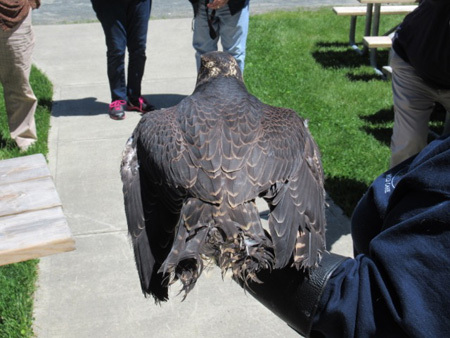 For example, we saw a beautiful captive peregrine falcon, but when he was turned around we could see that his tail feathers were permanently mangled, he couldn’t fly. 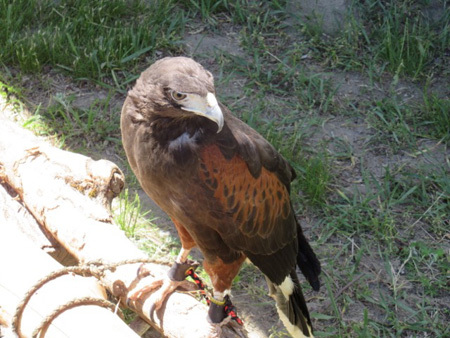 We were told that an enormous red tailed hawk, the biggest I’ve ever seen, had “something wrong with his brain and could not fly.” Sure enough when he became agitated he kept falling off his perch and had to be put into his enclosure. It was the peregrine falcons in captivity that saved the species from extinction in North America. These birds are used for hunting, enthusiasts are devoted to the birds. Back in the 1960s when those enthusiasts heard that the falcons were disappearing in the wild they became quite concerned. 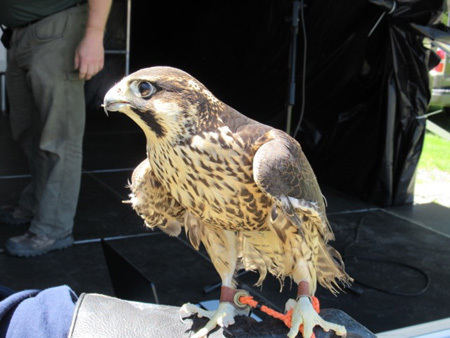 A good number of falcon owners willingly donated their birds to the project to develop a breeding stock to replenish their numbers in the wild. This ensured genetic diversity of the peregrines which is crucial to long term survival. The lessons learned with peregrine falcons led to an alliance of a group of concerned experts who, mostly with their own time and money, worked to bring back the bald eagles. Actually, these experts didn’t really know what they were doing, they had to innovate on the fly because nothing quite like this had ever been done before. But after they got going on their project they received valuable support and assistance from the NY State DEC.
Darryl McGrath Of Albany, Author Of "Flight Paths"
We learned about all this from an interesting talk given by Darryl McGrath, who lives not too far from us in downtown Albany. 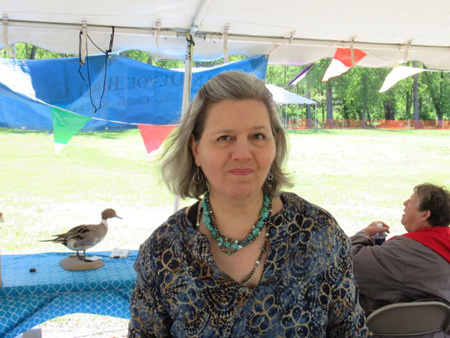 Ms. McGrath is an award winning journalist who recently published a book about the incredible saving of the peregrine falcon and the bald eagle and other raptors from extinction called “Flight Paths, a field journal of hope, heartbreak and miracles with New York’s bird people” published by SUNY Press. The book is a crucial record of how citizen activism is vital for preservation of our land and thus for our society at large, naturally we bought a copy of the book which I look forward to reading. Central to the story is the almost unknown Dr. Thomas Cade of the Cornell University Laboratory of Ornithology, whom Ms. McGrath says is one of the most important conservationists of modern times. Having demonstrated that it was possible to raise peregrine falcon eggs in captivity and introduce the chicks into nests after which the adults would raise the birds to full term, he and others showed that this technique worked on bald eagles. More than anything else this active intervention brought the birds back from the edge of extinction inside of a few decades. These actions relied not so much on accepted scientific procedure, publishing papers with peer review, conducting experiments and compiling data, etc. which is usually an exceedingly slow process. There simply wasn’t enough time, if they had done that the birds would have completely disappeared while everyone was contemplating the best course of action. Instead Dr. Cade and his allies relied on readily available poultry farming techniques which they refined as they went along by trial and error. With the falcons this involved rappelling up exposed cliff sides to find the nests. The conservationists (which is what environmentalists were called back then) had to wear helmets as they climbed because of the danger of attack by the adult falcons who vigorously defended their eggs and their chicks. The birds are small but powerful, in their preferred environment the humans hanging by ropes are at a distinct disadvantage in a battle. With the bald eagles it was much easier for the humans to climb trees, the birds prefer tall pines because the trees provide shelter from storms but will settle for tall broadleaf trees. The enormous adults were less threatening to the climbers than the falcons, after four weeks the chicks can defend themselves adequately and besides, no other creature besides humans even thinks of messing with bald eagles. The adults would actually stand to one side of the nest and and act agitated while the humans messed around with their eggs and chicks. At one point there was only one pair of nesting bald eagles left in New York State located in a remote area near Syracuse called the Montezuma Wildlife Refuge, but the female was found to be sterile. After several attempts the birds accepted a hatchery chick into their nest and raised it to adulthood. These chicks came from eggs brought from several northern states including Alaska, where there was still a fair sized and genetically diverse population, and where there were still many birds that had not yet been seriously poisoned by DDT. Remote video observation of New York's only surviving bald eagle pair showed that the birds were carrying out all the functions of nesting, but their eggs broke before they could hatch. Since it appeared that this pair would be good parents, DEC bald eagle program personnel devised a plan to give them a chance. Within two weeks of the birds settling into incubation, a biologist climbed to the nest, removed any egg present and inserted a plaster dummy egg. The adult birds incubated the artificial egg as their own for the next two to four weeks, while project personnel obtained a bald eagle chick from a captive breeding facility, brought it to New York and "transplanted" it into the nest. 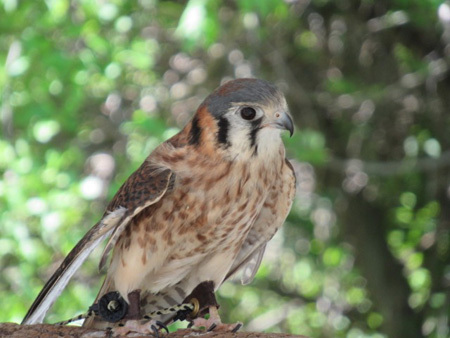 For three years, this pair accepted, cared for and fledged captive-bred chicks. After the male of the original pair died, the female mated with a hacked [hand raised by humans] bird. They returned to the nest site and fostered five more chicks in subsequent years. Since then, hacked eagles have occupied the nest, continuing use of the territory for breeding. That male bird that the maybe 20 year old sterile female returned with, which Ms. McGrath described as a “hot young four year old guy” lived to the ripe old age of 38 and is thought to have sired hundreds of chicks. Having proven that their techniques were successful, in the 1980s the DEC first completed an initial goal of establishing ten productive nesting pairs in the State. After that they exported their techniques to other States that were interested in establishing bald eagle populations. Yet the federal government did play a crucial role in the reestablishment of the raptor populations by banning the sale and use of DDT. Way back in 1962 Rachel Carson’s best-selling book Silent Spring implicated DDT in the disappearance of these birds and other wildlife across the country, along with causing serious health problems in humans. In 1972 the federal Environmental Protection Agency (EPA) enacted a partial ban which was immediately legally assailed both by pesticide corporations and by the newly formed Environmental Defense fund (EDF) which demanded a full ban. By the 1990s DDT was fully banned in some 26 countries. But the pesticide is still being produced and is occasionally used in limited “vector control,” for example in 2004 in California to contain an outbreak of bubonic plague. But the deadly and often ineffective poison is still used for agriculture in India and is produced for wide use in North Korea. This is a good reason to consider not eating food imported from India, and a typical failure of the Corporatist political system of North Korea. The first time I ever saw a bald eagle in the wild was in the late 1990s in a nature preserve in Florida, and a few years later I saw one while riding in a car crossing a highway bridge in the Catskills in New York State, the bird gliding along the same speed as the car. Both of these were jaw dropping stunning events for me. Now every summer when I go kayaking in Great Lake Sacandaga I make sure to check out a bald eagle nest I know of on one of the islands, and when I do sure enough at least one of the birds swoops overhead to check me out and make sure I’m no threat. You see, the adult bald eagles will let a human stick their hands into a nest and mess around with the contents, but will chase off any threatening thing that approaches the nest. Ms. McGrath tells a story of how a helicopter that biologist Peter Nye was riding in a remote region of Alaska was attacked by one of the birds. I have to say that paddling by myself in the middle of the lake and having a bald eagle with a six or seven foot wingspan pass low and slow overhead looking at me critically with that eye... well, I sure feel like meat. Meanwhile in this century red tailed hawks (“chickenhawks”) have become a common sight in my own South End neighborhood. The birds keep daily schedules traveling about watching for prey such as squirrels and pigeons. Their schedules are so precise you can quite literally set your clock by their appearance in a certain treetop. How they tell time like that is one of those amazing mysteries. In a time when so many species of animals and plants are teetering on the edge of extinction it’s good to hear of a success story like this. It shows that recovery is quite possible and can be achieved quickly and dramatically if we have the will to make if happen. But we can’t take such successes for granted because progress can be just as easily reversed by the chronically greedy and stupid who can grab positions of power at any time. The important thing to take away from a story like this is that such successes do not begin with the government and certainly not with the self-serving corporations, but always start with concerned citizens who care enough about their country to maintain its wildlife and its resources. Finding a way to stop the slow poisoning of our nation and the elimination of our nation’s natural life is very much a patriotic act. Environmentalism is a form of true patriotism, and if we want to survive not just as a nation but as individuals then we will all need to become patriots ready to defend our country from those who would destroy us all for momentary monetary profit.